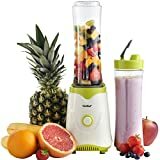 Buying a Personal Blender? Find the best offers on Kitchen & Cook Shop! 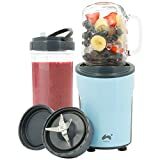 This page is updated regularly with best selling and highly rated personal blenders (also known as mini blenders) that currently have a special offer. These deals sell out fast so make sure you don’t miss out on these bargain prices. If you have a busy lifestyle but want to eat healthily it can be tough, so the Breville Blend-Active was designed especially for you. It is so quick and simple to make nutritious shakes and smoothies by simply blending together your ingredients in the same bottle that you drink out of! Forget the hassle of using a full sized blender and whip up slushies and protein drinks with ease. Simply put your chosen ingredients in the bottle, attach the blade unit, drop it onto the base unit, and blend to your liking. Once done, just take off the blade unit and pop on the leak proof lid – and off you go! The Breville Blend-Active Family Pack includes four bottles in two different sizes making it perfect for the whole gang. You’ll also receive some great healthy recipes to get you started. With an RRP of £38.99 you can find some great deals available – See below! Enjoy your first steps towards a healthier diet by using the NutriBullet 600 Personal Blender. 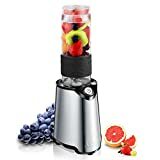 It has bullet cyclonic technology and a special Extractor Blade designed to break down fruits, vegetables, nuts and even ice into a delicious and nutritious smoothie free from pulp. It’s a simple way to achieve your five a day! 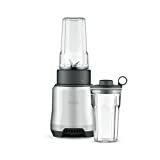 This 8-piece blender set has an RRP of £89.99 and includes a 600 Watt base, an pulverising extractor blade, a 680ml cup, a 511ml cup, a lip ring, stay fresh lid, user manual, and nutritionist booklet. 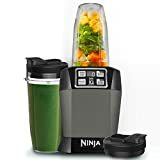 With an RRP of £99.99, the Nutri Ninja® with Auto IQ is a very highly rated personal blender with lots of features. Its one touch intelligence known as Auto IQ pulses your ingredients into a delicious smooth juice without and grit and with all the fruit and vegetables’ fibre and goodness. The Nutri Ninja® with Auto IQ has two settings – Blend and Ultra Blend. With the blend setting you can extract nutrients from leafy greens, fresh fruit and yoghurts. With the Ultra Blend setting you can extract nutrients from frozen fruit and ice, kale and carrots, nuts and seeds. It has a powerful 1000 watt motor and included is a 30 recipe guide with easy to make recipes. The Nutri Ninja with Auto IQ comes with the power base, Pro-Extractor blades, 1 x 500ml cup, 1 x 650ml cup, 2 x sealed lids, and a recipe guide. Faster than a bullet, fiercer than a ninja the VonShef UltraBlend Personal Blender has a powerful 1000W motor and razor-sharp extractor blades to make easy work of blitzing fruit and vegetables, pulverising seeds, stems and skins to extract and keep all the important nutrients in your healthy smoothie. In this personal blender you can also make sports drinks, protein shakes, and fresh juices – an easy way to fit in your five-a-day! The VonShef UltraBlend can effortlessly crush ice cubes for refreshing chilled drinks too. 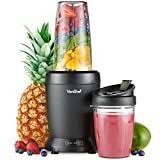 This VonShef blender has an RRP of £99.99 and includes 1 x large 800ml and 1 x medium 500ml cup (both BPA-free), 1 x spill-proof lid and 1 x sip & seal lid. The instruction manual includes six recipes to get you started and you also benefit from enjoying a manufacturers 2 year warranty. Featuring the simplicity of the best-selling Breville Blend-Active, the Blend-Active Pro Blender offers you a sleek, premium style and extra features to take your personal blending to the next level. 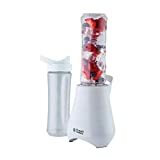 This personal blender has a 300 W motor, angled stainless steel removable blades and a pulse function, allowing you to blend tough ingredients such as nuts and ice. The included 500 ml BPA-free blending bottle has super-seal leak-proof lid and included is a stylish neoprene sleeve to keep drinks cooler for longer. This blender has an RRP of £49.99, which is good value, and even better value when on offer!